Consultations are by appointment, with the exception of emergencies, which of course always take priority. Normally you should not need to wait long for your appointment. Treatment of the same case by the same vet each time is encouraged to ensure continuity of treatment and assessment. Home Visits can be arranged, but please remember that cost of travel and time, make these expensive. Limited facilities available in the home make a visit to the surgery more efficient and of greater value to your pet's health. Surgery is performed on the premises. The dedicated operating theatre is fully equipped to cope with a wide range of orthopaedic and soft tissue surgery. An ultrasonic scaler and modern equipment is employed for dental work. 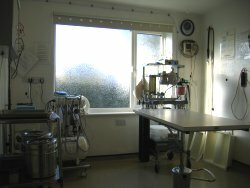 Anaesthesia is now a relatively safe procedure using modern equipment and drugs. Patients are closely watched by trained staff and continually assessed by a 'state of the art' respiratory and E.C.G. monitor. Hospitalisation Facilities are provided for the very sick and those recovering from operations. Our kennels are maintained to the highest standard of hygiene. Heating and bedding are provided. You will be able to see your pet into its kennel personally and help him/her to settle in. Our in house laboratory equipment enables results to be obtained often within a few hours. Cats can be tested for leukemia and other viruses. In certain circumstances it may be necessary to refer samples to a specialist laboratory. In addition a wide range of informative pamphlets are freely available. Hills Veterinary Diets are on sale and our nutrition advisers will be happy to advise you about feeding your pet and give you a sample or two to take away. Preventative Care is the cornerstone of our practice philosophy. Annual vaccination against infectious diseases for all dogs, cats and rabbits is highly recommended. Pre-vaccinal, adolescent and elderly animal health checks are all part of our comprehensive range of services. Specialist referrals are available including osteopathy and homeopathy. Free Pet Weighing we offer a free weight check for all pet animals. please call in during opening hours and talk to a member of staff. Free Nurse Consultations are available for Puppies/Kittens, Adolescent and Older animals are available - please ask a member of staff for details.